The Minnesota Forecaster: Will Wednesday Provide the Century Icing to the Heat Wave Cake? 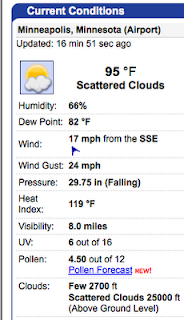 Assuming quality control, Moorhead just shattered the state record with a heat index of 134 (95/88). Is that airport in the middle of a cornfield? I wonder how reliable the readings (or positioning of the instruments) are at locations less official than international airports. Does the NWS grade the quality of weather reading set ups or otherwise provide some sort of quality control? I wouldn't be surprised if NWS Grand Forks checks out the instrument. A dew point of 88 is almost impossible to get outside a micro scale location. There also seems to be some question as to whether the 119 heat index was tied. Several forecasters tweeted the 119 but Paul Douglas's blog says only 118 was confirmed. Wonder how that whole record keeping/record confirmation process goes. @Bill - I worked on a project that used geographic information systems to perform surface weather observation site suitability analysis (make a map of where it'd be acceptable to place a weather station) when I was in college, and the requirements are fairly straight forward; in short, you want a location thats in the middle of field without any sort of topographic features (trees, buildings, hills, etc.) that impede the wind. As it turns out, airports almost always meet all of these criteria, and most of the surface weather observations we rely on in this state come from airports. I'm not sure how much of a role, if any, the NWS plays in the siting or maintenance of the weather observation network in this state; in Oklahoma, where I went to college, there was a state agency that managed all of that; I suspect it's mostly a mix of the FAA/NWS up here. Thanks for the great input, Nick. Incorporated your heat index explanation in the most recent post. Why are heat indexes taken at airports? We don't live on airports, we live in cities where things are hotter. If we want to judge conditions for the way they affect us, you judge the conditions with how we live in them. Of course it is easiest to eliminate external variables affecting the weather readings at an airport, but since buildings, pavement, etc in cities have a significant affect on weather conditions, this should be taken into account. The whole point of a heat index is to tell us what it FEELS like outside. Again, difficult to do in practice, but how heat is actually affecting us it isn't just academic.